Since Mother's Day is just around the corner (Sunday, May 10th) ... I thought it would be fun to share a little bit about France's holiday. 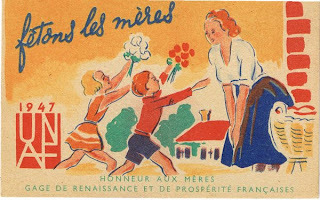 Fête des Mères is held on May 31st. The holiday in France dates back through the ages. Napoleon started the festivities and the holiday was made official by the government in 1950. Of course, the usual highlight of the day is a big family dinner (hopefully NOT prepared by mom!) They are a big deal and all the family attends, with all of the various mamans, grandmères, etc. This is a day to cater to mom and the French do it well! Family is a mainstay here ... and this is a day that families recognize moms as their source and inspiration. For me, this Mother's Day is also significant because the year and Sunday in May that Johnelle was born was also Mother's Day! what a great Mother's Day gift that was for me!